Zombie Haze Feminised is a long-flowering 70% sativa strain. It was bred by crossing Amnesia Ganja Haze with White Widow Original. 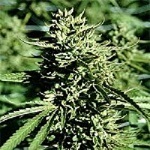 Zombie Haze Feminized Marijuana Seeds by Sumo Seeds: Zombie Haze Feminised is a long-flowering 70% sativa strain. It was bred by crossing Amnesia Ganja Haze with White Widow Original. 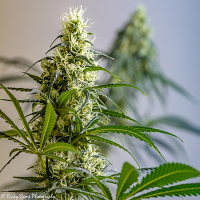 This cannabis plant can be grown outdoors but only in tropical and sub-tropical conditions as this is a plant that likes heat, a long growing season and plenty of sun. Indoors it is a medium-sized plant that can reach 130 to 160cm tall yielding about 450 to 550gr/m2 after a flowering time of 11 to 12 weeks. Outdoors they will grow much taller, especially if planted directly into the ground instead of pots, expect something between 200 to 230cm and yielding 650 to 850gr/plant in November north of the equator and March to the south. 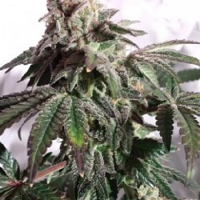 Zombie Haze produces very high levels of THC with correspondingly low CBD production. the range of flavours is sweet, floral, spicy and pine. The effect of Zombie Haze is extremely psycho-active and long-lasting and one which has more than a little edginess - get ready for the ride!